The Crawford Fund has launched its 2018 Food Security Journalism Award at a Crawford Fund Queensland Committee event highlighting the involvement of young researchers in agriculture for development and food and nutrition security. “Today we are here at Parliament House in Brisbane, at a Queensland Crawford Fund Committee Forum, to hear from expert panelists well known to the Crawford Fund, and from passionate young Queensland researchers discussing their work in developing countries through Crawford Fund training, scholarships and awards,” said Dr Colin Chartres, Chief Executive of the Crawford Fund. “It is fitting that today, after hearing the experiences of our researchers, mentors and young early career researchers, we launch our Food Security Journalism Award. 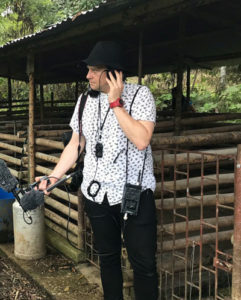 “This annual award sees a journalist undertake a ‘seeing is believing’ visit to agriculture for development projects in the field, and interact with students, researchers, and local farmers as passionate as those we have heard from today, and to share their stories with the Australian public. “Much of the vital food and nutrition security and agricultural development work we do through the Crawford Fund occurs overseas, beyond the day-to-day focus of the media spotlight. This award provides an opportunity to shine a light on the difference Australia’s agricultural development programs are making in changing the lives and livelihoods of those who need it in our region. “Like our staff, trainers, mentors and scholars, I have no doubt that the journalist who wins this award will benefit immensely from being on the ground and seeing agricultural development and research first-hand and meeting the extremely passionate people dedicated to improving food security,” said Dr Chartres. “The standard of entries each year is fantastic, and we hope to receive many nominations from Australian journalists for this year’s award for work they have done addressing the theme of global food security issues, including the complexity of food security and agriculture for development, and the mutual benefit of R&D interactions with our developing country neighbours. Brett Worthington, our 2017 winner reported on a range of projects during his time in Cali, Colombia. All entries need to have been published in the 12 months leading up to the closing date of COB Monday, 4 June 2018, and should be submitted to the Fund’s Director of Outreach, Ms Cathy Reade by COB Friday, 15 June 2018, to be considered by a reviewing/judging panel. For more information, download the information sheet or contact Ms Cathy Reade. The winner will be announced at the Fund’s Annual Conference to be held in Canberra on 13 and 14 August. Further details, including the application and judging processes, are available here.